Material deposition is an essential ingredient in certain manufacturing processes, including welding and additive manufacturing. Say that you want to simulate such a manufacturing process. A challenge that you will face during the simulation is depositing material in a way that introduces it in a state of zero stress. Here, we look at the Activation functionality in the COMSOL Multiphysics® software and how it facilitates the simulation of material deposition. Why Activate or Deactivate Material? Imagine that you want to simulate a structural material that is in a molten state and then solidifies. Alternatively, the material is initially solid and then melts. 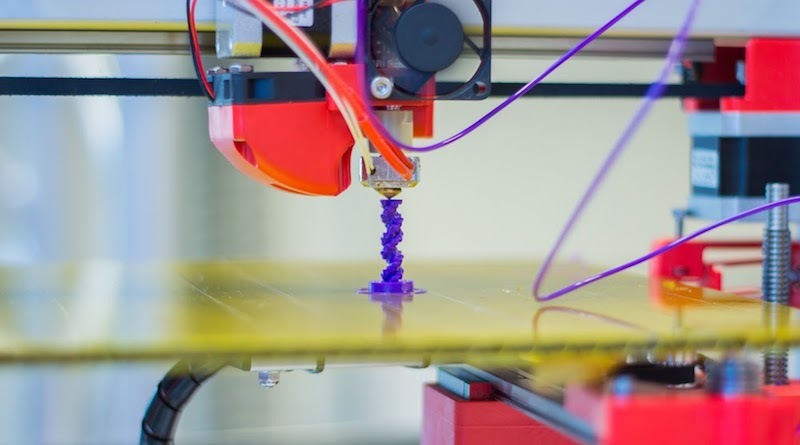 This can be the case when you want to simulate manufacturing processes such as arc welding, selective laser melting, and selective laser sintering — the last two being common additive manufacturing methods. Material activation is useful when simulating additive manufacturing processes. Image of a 3D printer by Jonathan Juursema — Own work. Licensed under CC BY-SA 3.0, via Wikimedia Commons. You can use the Activation node to activate or deactivate material in a simple manner during a simulation. As a note, the Activation node is available in the add-on Structural Mechanics Module and MEMS Module as of version 5.4 of COMSOL Multiphysics®. One approach to emulate that material is structurally absent is to simply reduce its elastic stiffness to a point where it becomes negligible. This way, the rest of the structure is free to deform without “feeling” the structurally weaker material. This is a viable approach as long as we have no desire to actually activate material. A problem arises if we try to activate the weak material by simply restoring its stiffness to the nominal level at some point during the simulation. When the stiffness is restored, any strains present in the activated material will suddenly produce stresses. In most situations, this is not a desired effect when activating material. Instead, material should be activated in a state of zero stress. This is more physical, as we usually want to emulate that material is deposited or solidified. The Activation node avoids the problem of the artificially produced stresses described above. This node reduces the stiffness of the inactive material as described before, but, importantly, it also removes any elastic strains that are present at the instant of activation. Simply put, material is activated in a state of zero stress. The Activation node is located under the Linear Elastic Material node, as shown in the figure below, and it is available for the Solid Mechanics and Membrane interfaces. The Activation feature and its Settings window. The Activation expression setting is a logical expression that you define. It is used to determine whether the material is active or not, and it is defined per integration point of the mesh elements. For example, an activation expression that reads T<T_s says that the material is active if the expression is logically true (when the temperature, T, is less than the solidification temperature, T_s) and inactive otherwise. The Activation scale factor setting defines the factor that multiplies the elastic stiffness to emulate that material is not present. It has a default value of 10-5, but you can change it if you wish. However, a value that is too low could make the stiffness matrix ill-conditioned. The variable isactive indicates the current active/inactive state of the material, while the variable wasactive indicates whether the material has been active at any previous point during the simulation. 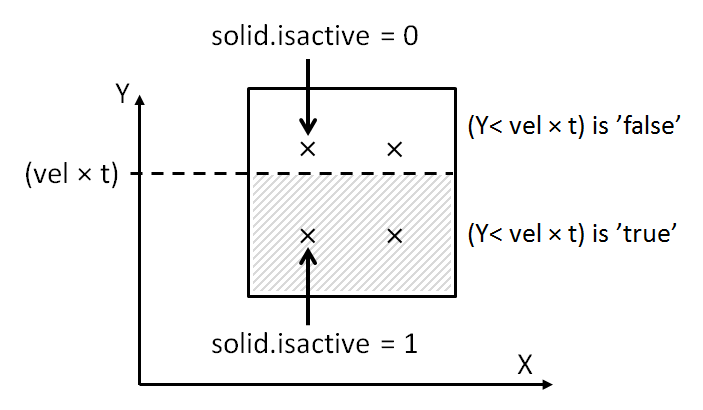 In the case of a Solid Mechanics interface with the tag solid, the variable describing the current state of the material is called solid.isactive. The wasactive variable can be used to simplify the formulation of the activation expression in some situations, as we will see below. Note: If a material undergoes multiple activation/deactivation events, the elastic strains are removed at every instant of activation. This means that the material is always activated in a state of zero stress, regardless of its history, including past activations or deactivations. Inelastic strains, such as plastic strains, are not removed. Let us look at some examples of how to use the Activation node. As a simple 2D example, suppose that you want to gradually activate a material in the y direction as time, t, progresses. The imagined “activation front” travels at a velocity, vel, and the region of active material is therefore given by Y<vel\times t. It is entered as the activation expression, as shown in the following figure. Activation expression for pointwise material activation. To illustrate this, consider a solid quadrilateral element with four integration points (Gauss points), as in the figure below. With the activation expression above, each integration point is activated individually by evaluating the activation expression. This means, in practice, that a single mesh element can be partially active if it has more than one integration point. Activation of individual integration points in a mesh element. Now, consider a case where you want to activate entire mesh elements, and not on an individual integration point basis. To do so, you need to phrase the activation expression so that it evaluates equally for every integration point in each mesh element. This can be done using the centroid operator. The activation expression that was used in the previous example is modified, as shown in the following figure. The coordinate Y is now evaluated at the mesh element centroid, which means that the activation expression will evaluate to the same value for all of the integration points in the mesh element. Activation expression for elementwise material activation. Inside the mesh element in the figure below, the activation expression is fulfilled for the element centroid, and therefore all four integration points are active. 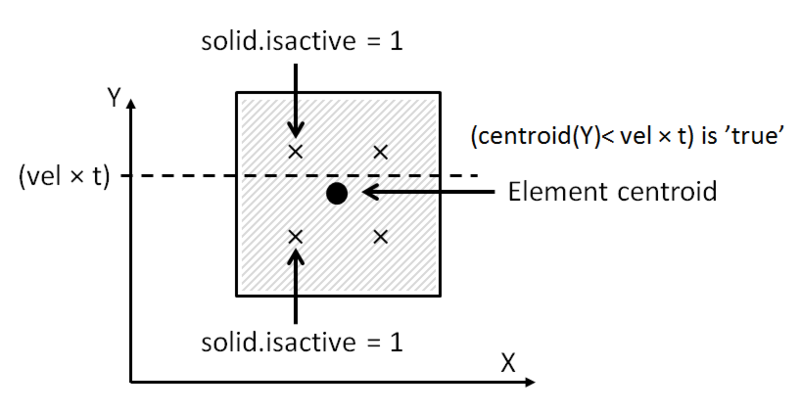 Activation of all integration points in a mesh element by using the centroid operator. which states that the material is active if the “logical expression describing the current position of the laser beam” is true or if the material has been active at any previous time (or parameter step) during the simulation. If the activation expression is used without the wasactive variable, the material would become inactive once the laser beam has passed, which is likely contrary to what is intended. Suppose that you have simulated a time-dependent process where material is deposited over time. It may be interesting to display results only for the active parts of a domain. You can do this by using the variable isactive as the Logical expression for inclusion in the Filter node, as shown in the figure below. Note that depending on the chosen fulfillment type, the isactive filtering may show slight differences compared to the underlying isactive variable defined at the integration points of the mesh elements. Using the Filter node to display only active parts of a domain. 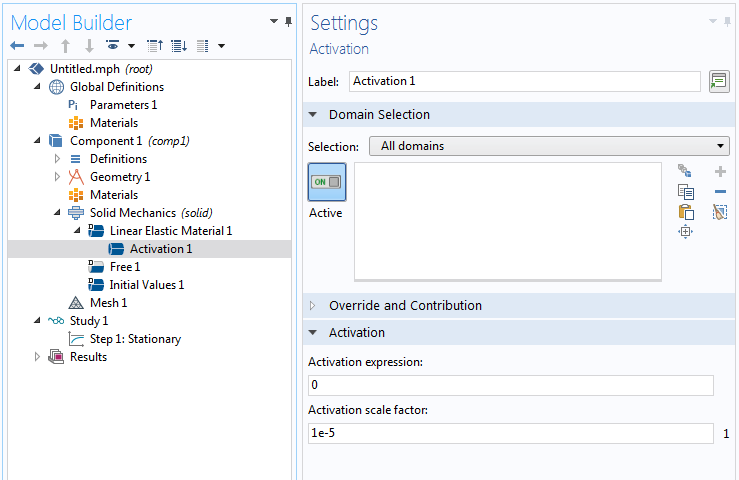 In this blog post, we have described different ways of using the Activation node to activate material during a simulation. The Activation node makes it easy to simulate the deposition of material in simulations of different types of manufacturing processes, such as welding and additive manufacturing. If you want to examine a model that uses the Activation node, click the button below to see the Thermal Initial Stresses in a Layered Plate example in the Application Gallery. Note that you need to have a COMSOL Access account and valid software license to download the related MPH-file. Can we do this for heat transfer problems with a moving heat source. IF yes. where can I find this activation option? The Activation node is only available for the Linear Elastic Material. However, you can use the variables “isactive” and “wasactive” in other contexts, too. See Example 3 above. Suppose that we have a moving Gaussian volumetric heat source. So where do we have to specify this “wasactive”. Do we define this in in the analytic function that we will define for the heat source or we just simply define it under the heat source node. This is a very interesting and useful topic to me. Now I am a bit confused by the centroid operator. Could you please further explain this operator at a more mathematical level? Is it correct if I regard it as a volume averaged value of a variable over a single element? Well, it depends on what you intend to do. Suppose that you already have a description of the path that the heat source takes. 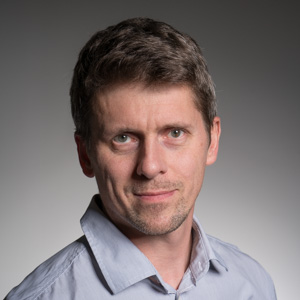 If your modeling approach is to activate material when the temperature exceeds a certain value, then you probably want to keep the material active even if the temperature decreases subsequently. An example would be if you want to emulate welding, where the material should remain even after the heat source has passed. In that situation you could use the “wasactive” variable in the Activation expression to “remember” that the heat source has activated material at a certain location previously. Or, as in Example 3, if you do not solve the actual heat transfer problem, it may be sufficient to simply track where the heat source is, and where it has been. As a side note, you can use the Activation variable “isactive” from a Solid Mechanics or Membrane interface to modify material properties such as heat conductivity. how to have an activation front moving in 2D with a square waveform pattern (as in Fused Deposition Modelling)? This sounds similar to another question that was asked above (regarding moving heat sources). See if that helps. Otherwise, you can contact Comsol Support if your problem is very specific. true, thank you for your reply. However, I do not fully understand example 3. I already have a mathematical expression for the path of my heating source and I would like to study the heat transfer as it moves. I have read that I can use the variables isactive and was active also elsewhere but where should I type my activation condition? Still in the Activation node under the liner elastic material node even though I want to study the heat transfer? The activation expression only pertains to the Linear Elastic Material under which the Activation node is used. So if you phrase an activation expression using information about the position of the heat source (which you know) or in terms of the computed temperatures, this will determine how the linear elastic material will be activated during the simulation. Now, for material that is not active, it is likely that you want to modify not only the elastic properties, but also properties such as thermal conductivity. For this, you can use the variable isactive. Suppose that you want to emulate that the thermal conductivity changes depending on whether the material is active or not. An expression for the thermal conductivity could then be entered as k0+k*solid.isactive, where k0 is small compared to k.
my apologizes but I cannot find the answer to my question in your reply. I would like to model how deposited material as in example 3 heats the air around. As such, the material is deposited over time. I thought the Activation node was the answer but this belongs to the Linear Elastic MAaterial only. Where should I then use my activation expression? Thank you. I successfully implement the activation node simulating the deposition process. Though, I have a doubt on how to simulate the temperature front. I tried by giving the plain extrusion temperature to the initial values node of the heat transfer in solids and liquids physics but the freshly activated (deposited) material is colder than expected. Thank you for your help. Please contact our Support team for additional help with your modeling.